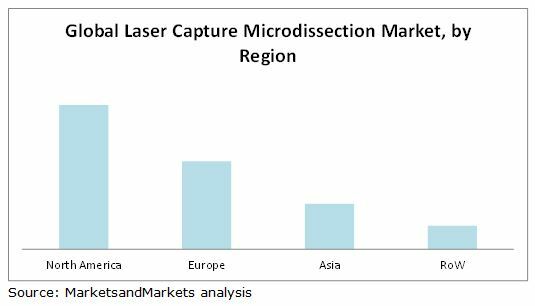 The global laser capture microdissection market is expected to reach USD 124.97 Million by 2020 from USD 72.45 Million in 2015, at a CAGR of 11.52% between 2015 and 2020. Laser capture microdissection (LCM) is a contact- and contamination-free method of isolating specific single cells or entire areas of tissues from a wide variety of samples using a focused laser beam. This technique preserves the original morphology of the dissected tissue sample. This market report studies the potential of instruments, consumables, and software for diagnostics and research and development in the molecular analysis of tissue samples. The major drivers for the market include the increasing healthcare expenditure, increase in R&D funding, and technical advantages of LCM. On the other hand, the high manufacturing and maintenance costs of equipment and accessories, dearth of professionals with high technical expertise, and technical shortcomings of RNA degradation are the major factors restraining the growth of this market. 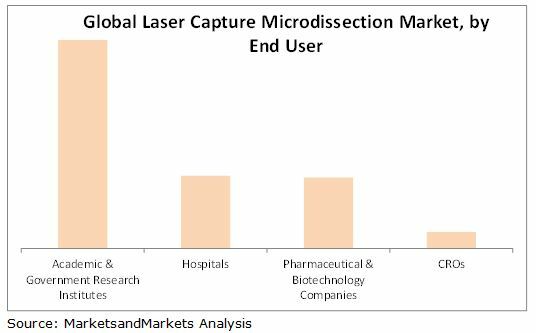 This report segments the global laser capture microdissection market by product, system type, application, end user, and region. By product, the market includes instruments, consumables, and software and services. The system types include ultraviolet LCM, infrared LCM, ultraviolet and infrared LCM, and immunofluorescence LCM. The applications segment includes diagnostics, research and development, and other applications. The end-user segments included in this report are academic and government research institutes, hospitals, pharmaceutical and biotechnology companies, and CROs. Geographic analysis reveals that North America accounts for the largest share of the global market in 2015. Growth in this market can be attributed to the strong growth trends in the pharmaceutical companies and CROs. The Asian regional segment, on the other hand, is expected to register a double-digit growth rate from 2015 to 2020, owing to the expansion of leading laser capture microdissection companies and increased R&D spending. R&D spending in Asia increased from USD 177 billion in 2003 to USD 329 billion in 2010, at a CAGR of 9.29%. The R&D spending in Asia accounted for 27.13% of global R&D expenditure in 2010. Major players in this market include Thermo Fisher Scientific, Inc. (U.S.), Danaher Corporation (U.S.), Carl Zeiss AG (Germany), Molecular Machines & Industries (Germany), INDIVUMED GmbH (Germany), Theranostics Health Inc. (U.S.), Ocimum Biosolutions LLC (U.S.), DeNova Sciences Pte. Ltd. (Singapore), 3DHISTECH Ltd. (Hungary), and AvanSci Bio LLC (U.S.). The global laser capture microdissection market is expected to reach USD 124.97 Million by 2020 from USD 72.45 Million in 2015, at a CAGR of 11.52% between 2015 and 2020. Major drivers for this market include the increasing healthcare expenditure and increase in R&D funding. Additionally, the emerging economies and technological advancements will provide opportunities and new trends for market growth. 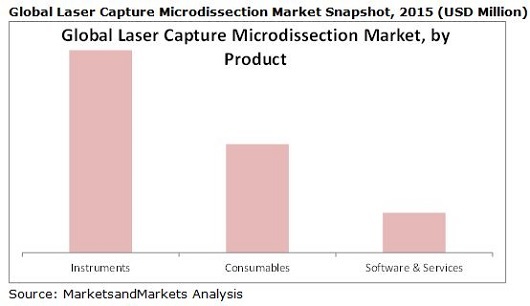 The report provides a granular understanding of the laser capture microdissection market. 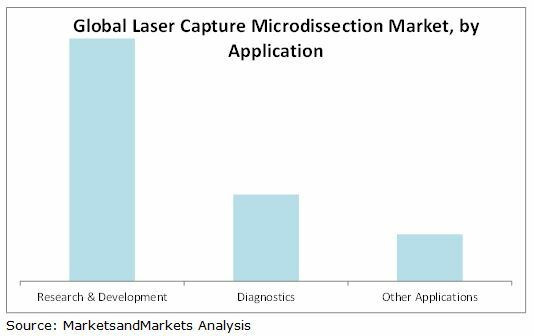 This report segments the global laser capture microdissection market on the basis of products, system types, applications, end users, and regions. The product segments included in this report are instruments, consumables, and software and services. The market on the basis of system types includes ultraviolet LCM, infrared LCM, ultraviolet and infrared LCM, and immunofluorescence LCM. On the basis of applications, the market is segmented into diagnostics, research and development, and other applications. The end-user segments included in this report are academic and government research institutes, hospitals, pharmaceutical and biotechnology companies, and CROs. The geographic segments included in this report are North America, Europe, Asia, and the Rest of the World (RoW). The report maps each test type and product segment in 11 geographic and regional segments. 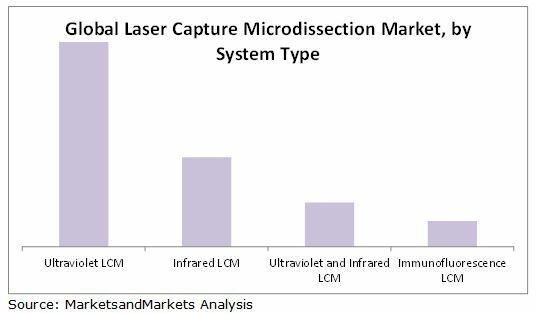 Major players in laser capture microdissection market include Thermo Fisher Scientific, Inc. (U.S.), Danaher Corporation (U.S.), Carl Zeiss AG (Germany), Molecular Machines & Industries (Switzerland), INDIVUMED GmbH (Germany), Theranostics Health Inc. (U.S.), Ocimum Biosolutions LLC (U.S.), DeNova Sciences Pte. Ltd. (Singapore), 3DHISTECH Ltd. (Europe), and AvanSci Bio LLC (U.S.). 12.4 Thermo Fisher Scientific, Inc.
12.6 Denova Sciences Pte. Ltd. Figure 62 Research & Development to Form the Largest Application Segment in the U.S. Figure 89 Company Snapshot: Thermo Fisher Scientific, Inc.